Write a c++ program to check whether a entered year is leap year or not. 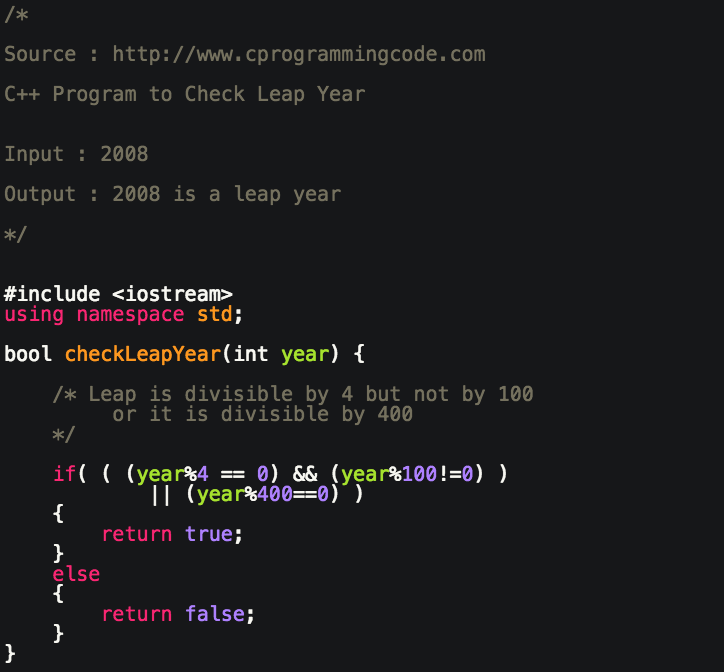 In this programming tutorial, We are going to write a c++ code which takes an input year and check whether a entered year is leap year or not. In my previous tutorial, I have explained what is a leap year and algorithm to check leap year. A Leap year is a year which has 366 days. It means it has one additional day. How do we check whether a entered year is a leap year or not. i) If a year is divisible by 4 and not divisible by 100 then it's a leap year. For example - 2012, 2008 etc. ii) If a century year (1200, 1600) is divisible by 400 then it's a leap year. For example - 1200, 1600 etc.